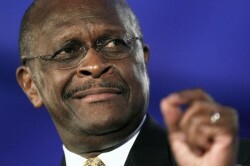 Herman Cain doesn’t understand the #OccupyWallStreet protests. CAIN: I don’t have facts to back this up, but I happen to believe that these demonstrations are planned and orchestrated to distract from the failed policies of the Obama administration. Don’t blame Wall Street, don’t blame the big banks, if you don’t have a job and you’re not rich, blame yourself! It is not someone’s fault if they succeeded, it is someone’s fault if they failed. If government doesn’t allow banks that made bad decisions to be punished by the market, then the bailed-out zombie banks can rumble on for years, parasitising the taxpayer in the name of ever-greater bonuses for management, while failing to lend money, create new employment, or help the economy grow. The global financial system isn’t working because there are fundamental structural problems with the global economy. These include over-leverage, the agency problem, trade deficits, failed economic planning, massive debt acquisition, Western over-reliance on foreign oil and goods, military overspending, systemic corruption, fragility and so forth. Stabilising the global financial system merely perpetuates these problems. The market shows that it needs to fail — preferably in a controlled way so that real people don’t get hurt — so that we can return to experimental capitalism, where good ideas prosper, and bad ideas don’t. Bernanke’s organisation — the private Federal Reserve — pays a 6% dividend to member banks. That’s a staggering risk-free return on investment. Is it any wonder that banks won’t lend to small businesses or common people when the chosen few can just make easy money through having their funds sit at the Federal Reserve? So no — Herman Cain is wrong. Protestors shouldn’t be blaming themselves for their “failure”. They should blame a system of government and monetary policy that gives money and favours to its friends. Call it crony capitalism, or corporatism or simply call it corruption. This entry was posted in Current Affairs and tagged bernanke, black swans, capitalism, central banking, geithner, herman cain, thomas jefferson, wall street. Bookmark the permalink. End the Fed – Ron Paul. And from what I understand the Act also exempts taxation. So that is an after tax risk free 6%! And it is posted on their website. That is like a big fat FU Citizens of the United States.